Basic WebPage Builder is a free web page builder with Bootstrap components, HTML export. Here this tool allows you to create a free web page using drag and drop operations and you can export the export the HTML code. This software has included a lot of Bootstrap components in it that you can add in your web page and align them. Without writing a single line of code, you can design the webpage visually and export that. The interface of this tool is very simple where you create any kind of web page with so many customizing options. 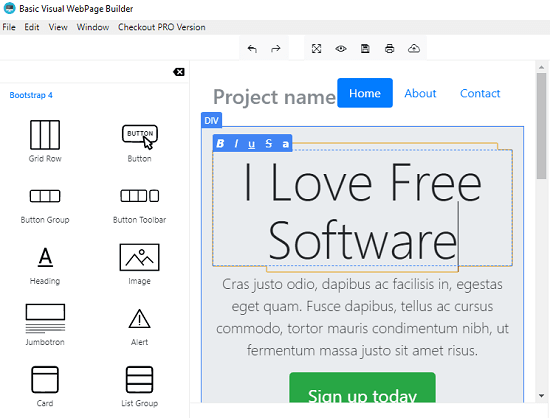 There are some online web page builder we have covered before but if you need a software that you can run on PC then you can go with the one I have mentioned in this post. Run the software and then simply design your page and get its code. Also, if you want to directly print the design that you have created then you can do that. This software comes with Google Cloud Print integration that you can use by adding your credentials there. You can easily create any kind of webpage and then save that on you PC. It is very simple to use this software on Windows to create any web page that you want. Download this software from here and then install it on your PC. After that, run it and the web page editor will show up. There is already a sample web page that you can see in the screenshot below. 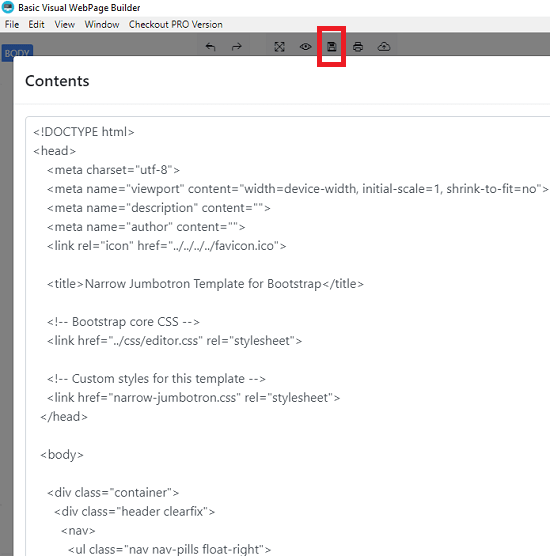 All the Bootstrap components are on the right side of the software. You can select anyone from there and drag that to the editor. After that, you can align that anywhere on the web page you like. Using the pane on the right side of its interface, you can add additional options such as specifying ID or Class if there is any. 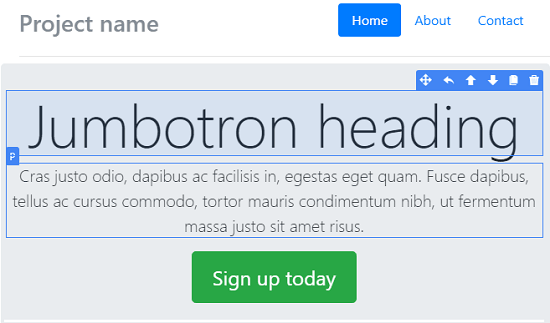 In Bootstrap components, it offers you button group, grid row, card list group, progress bar, check box, container, jumbotron, and may others. You just select anyone and then use that on your webpage. When you are done with the page, you can simply hit the export option from top side of the tool. After that, it will show you the code in HTML that you can copy and save anywhere you like. Also, there are options for print and cloud print in the toolbar. You can select them if you want to print the web page design you have created. In this way, you can use this simple yet effective software on your Windows PC to build web pages. This is a good software to create pages for static site and the deploy them. By creating different pages, you can combine them and convert them to a websites that you can host on a server. This is all about this free web page builder software that you can use. Use it to create simple and static web pages and get the corresponding HTML code. Also, you can opt to print the web page you have designed using cloud print. The interface is of this software is kind of WYSIWYG. 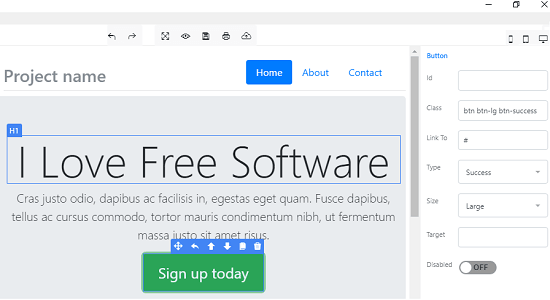 So, if you are looking for a free software to create simple web pages for your site then you can use the software I have mentioned in this post.